You know how I said I have some exciting new projects. Well one of them is a sorta internship at Attitude magazine. What it means is I will be writing a few articles for their online blog every week, the first 3 are online now. This is so exciting for me as I love this magazine (remember I wrote about it a short while ago?) and I guess I'm proving that mean online forum chick wrong, fat girls can work in the fashion media! Plus its great experience and can lead to more work. Anyway read my articles and tell me what you think please, and maybe I'll see some of you at the Retrostar sale? I'm so excited about that one. Good on you! That's awesome!! oh congratulations hayley! i picked up that exact issue of attitude at a shop on brunswick before xmas and i laaaarv it! i might just see you at the retrostar sale! i picked up so many goodies last time (and was the first one there, waiting in the pouring rain! ), hopefully i can do the same next weekend. with all my birthday money!! 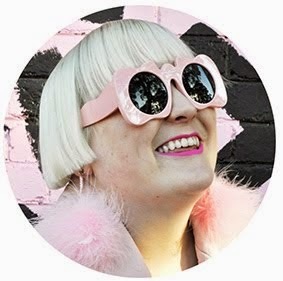 i'm sure i've mentioned before-- i love attitude, really great free fashion press, plus they've helped my businesses by writing about them too which is ace. I only just came across your blog a few days ago, and I love it already. I had a look at the 'mean online forum chick' link, and utterly agree with the responses your post evoked. Creativity and personality beat conforming and insecurity annny day. Attitude is an awesome magazine and a really wonderful opportunity! Congrats. Yay!! Congrats Hayley, off to have a read now. Congratz what awesome news I love that mag. So not fair I'm not there for the retrostar sale. I love retrostar. Oh and check target, they have cheap boots a little like the kind of mine you wanted. That's awesome! I love Attitude, it's a great mag. Great work! I really need to log onto that site more often. that forum chick is eating her words.. WOOT! i'm so excited and inspired by you totally workin' it in the fashion industry. it is truly awesome to read your posts and watch you getting more and more awesome opportunities come your way, thanks to all your hard work, smarts and totally individual style. everyone knows you are a total babe and you are destined to be a fashion icon, and that is where you are heading!!! i'm glad you could use that 'mean online forum chick's words to inspire you to TOTALLY GO FOR IT!!! only forum chick is probably just bitter because she's hungry. Hey Hayley! Gosh, I'm so proud of you! So many good things are happening. I really liked the articles! If I lived over there, I'd definitely be going to retrostar. 10 bucks?! Wow. Also..I like that you featured an artist..their work is really cool..
and speaking of art..my designs go LIVE on Topman.com tomorrow!!!!! They sent me the email with the image, I couldn't be more excited. Talk to you later!! Gambatte! Oh wow, congratulations!! That's really amazing news! You'll probably see me at the retrostar sale, my sister and I have been talking about it pretty much non stop - I think everyone wants to kill us. Hayley, when do you leave for Japan? P.S when is retrostar sale? loving your Blog.. i ran across it while searching for bikes.. i run a Toronto bike blog which is a spin off of copenhagen cycle chic, which merges fashion and cycling... i saw your bike post from your past issues... if you have any more updates of well dressed people who ride their bikes.. i'd love to see them...keep up the great work. congrats! the job/internship sounds great! i used to be 'love deserter' way way back but now i have a new blog at http://pranginout.blogspot.com . i've added your link and would love to be linked back, your blog is one of my favourites. love.